Today, in celebration of our 9th anniversary, we announce five recipients of 2018 Spring cycle of the “Discover Healthcare Interpreting” CoreCHI™ Scholarship. This scholarship supports certification of interpreters of languages for which only the CoreCHI™ certification is currently available, including refugee languages and languages of lesser diffusion. We would like to take this opportunity to thank Liberty Language Services and the Board of UMTIA for the contribution to our scholarship. 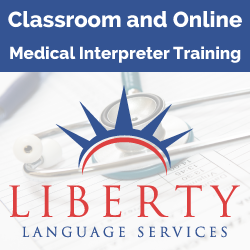 Liberty Language Services is a language services agency providing Your Total Language Solution— language access services to hospital systems, medical offices, legal firms, courts, public schools, state and local government agencies, universities, private companies and more. Core capabilities include on-site, face-to-face interpreting services, over the phone interpreting, video remote interpreting, and interpreter training. Liberty Language Services also offers other language services such as written translation, and American Sign Language (ASL) services. The company prides itself on offering unparalleled and quality services, by professionally trained interpreters and translators, at an affordable cost, 24 hours a day, 7 days a week. The Upper Midwest Translators and Interpreters Association (UMTIA) is a chapter of the American Translators Association (ATA) serving the geographic region of Minnesota, Wisconsin, Iowa, South Dakota, and North Dakota. UMTIA’s mission is to offer local educational opportunities for translators and interpreters, and to promote professional discussions and networking. CCHI, Liberty Language Services, and UMTIA commend the achievements and the commitment to professional success of the scholarship winners. We wish them the best of luck on their testing and certification journey. Information about the scholarship is available here.